Kevin Clegg grew up in Salt Lake City UT where he fished anywhere his pedal bike and legs could take him. Fishing opportunity really opened up to Kevin when he acquired a driver’s license but the finances limited him to the Provo, and Weber rivers with an occasional trip to the Green River in north east Utah. 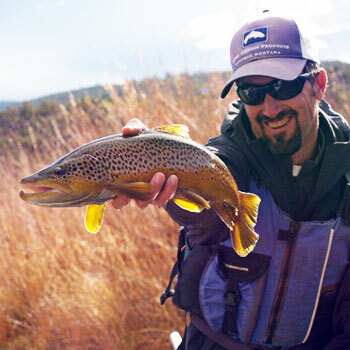 Kevin Clegg, a professional guide, has been guiding on the Green River in Utah for over 20 years. His knowledge of this exquisite fishery is deep and wide. Outstanding fly fishing and scenery make this fishery one for your bucket list. Join us as Kevin shares his secrets about this great piece of water. In 1993 Kevin took a break from college and was determined to dedicate a summer to fly fishing the Green River. He took a job at the Flaming Gorge Lodge and peddled flies at the Lodge’s fly shop only 3 miles away from the famed tail water below Flaming Gorge Dam. This allowed Kevin to fish the river every day. His greatest catch that summer was a wife! Kevin married Camille (a local Dutch John UT girl) and has never left the Green River. In 1994 he started guiding and has been an active guide ever since. In 2006 Kevin became a Co-Owner of the Flaming Gorge Resort and currently manages several aspects of this business including the Green River’s largest guide service. Guiding now is a part time job as the business and his six children keep him very busy. He serves on Utah’s Blue Ribbon Fisheries Advisory Council and continues to keep his finger on the pulse of the Utah’s most premier Blue Ribbon water the Green River. Although he has fished his way around the west, these days, when not on the Green, you will find him fishing Flaming Gorge Reservoir and other local waters close to home.